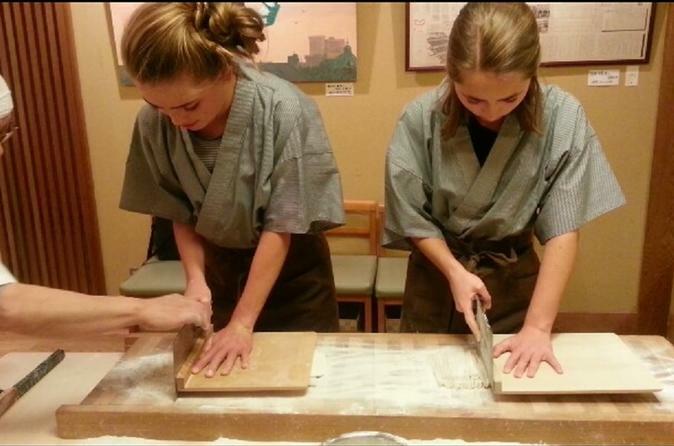 Learn Soba buckwheat noodle making and try your own made Soba noodle. Forty years experienced Soba chef, the restaurant’s owner spoon-feeds you!! (dough making,mixing,rolling and cutting the noodles) After the lesson you can try both your own made Soba and the other one made by the chef!! This program, held in the Soba noodle restaurant of "YANAKA Soba" noted for its authentic style and great tasting, is very popular among the locals!! Buckwheat flour ground by stone mills will create the top quality SOBA noodle. Roller mills are usually used for making buckwheat flour,but,the heat generated by rollers rotating at high speed spoils flavor of SOBA. That's why,the restaurant grinds buckwheat slowly and carefuly using stone mill to make great tasting SOBA flour. And,this restaurant uses only domestic buckwheat from specified buckwheat fields for its high quality. The skillful art of Soba noodle making using carefully made buckwheat flour makes up the great tasting Soba noodle having excellent feeling of smooth throat pass!! After making Soba noodle, you'll try your own Soba sitting comfortably in a reserved seat!! Moreover, it’s coming with complimentary two side-dishes and dessert!! And then, your thoughts go to the history of Japanese Soba noodle relaxing in spacious place!! SOBA’s cultural ties to traditional Japanese customs are evident in Toshikoshisoba eaten on new year’s eve to bring longevity and prosperity.